It’s time for Chinese Breakfast Showdown Part 2. Part 2? Where and what is Part 1? It’s Yi Mei vs. Yung Ho. This time, I will compare Yi Mei Monterey Park (review) to Four Sea in Hacienda Heights. 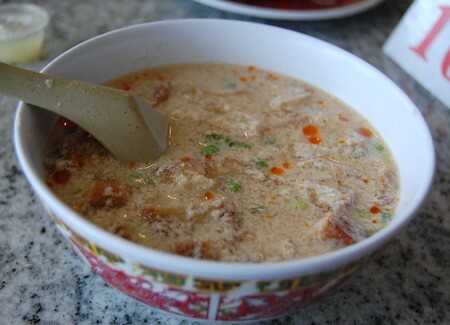 First and foremost is the savory dou jiang (soy milk). There was a bit of misunderstanding at Four Sea after I ordered a vegan version (sans meat floss) because they brought out the normal version but after I informed them of the mistake, they brought out the vegan version. Even though they left out the green onion, the dou jiang at Four Sea is creamier and has a richer taste than the one at Yi Mei. There was also more you tiao (oil crueller) in this one, which I like. 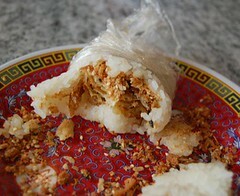 Next was the fan tuan (rice roll). As usual, I ordered the vegan version of this as well. It had the oil crueller inside, crushed peanuts, veggie meat floss, and dried nori. I thought this was comparable to that of Yi Mei even though Yi Mei’s version doesn’t have the nori. While Yi Mei’s fan tuan is delicious when it comes with a freshly fried you tiao, I have to say that the addition of nori in this one at Four Sea taste better. 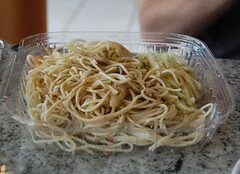 The BF ordered cold sesame noodles (len ban mien) at Four Sea and they tasted about the same as they would at Yi Mei. It was impressive that the noodles were still firm after sitting in the plastic to-go box for so long, but the sauce wasn’t anything special. Last but not least was the egg crepe. It’s basically a crepe with scrambled eggs inside. I prefer the one at Yi Mei to the one at Four Sea because there’s usually more green onion in Yi Mei’s. The one at Four Sea tasted a bit bland and the crepe was a little too oily. The ambiance at Four Sea is nicer and there are a lot more tables — I might take a bigger group (or a hot date!) there, but if it were just me and the BF, I would rather save the gas and stick with Yi Mei in Monterey Park. It’s closer and a bit cheaper.